In the box, there is the handheld device, 4 plug adaptors for worldwide use, 2 caps, 3 large discs and 3 small discs. The large discs can be used on the body (on the upper arms for example) and the small discs are for use on the face. There is also a step by step instruction guide and a dvd with instructions on how to use the device. It is recommended that you begin with the white disc as this is for ultra-sensitive skin and it will get your skin used to this level of exfoliation. 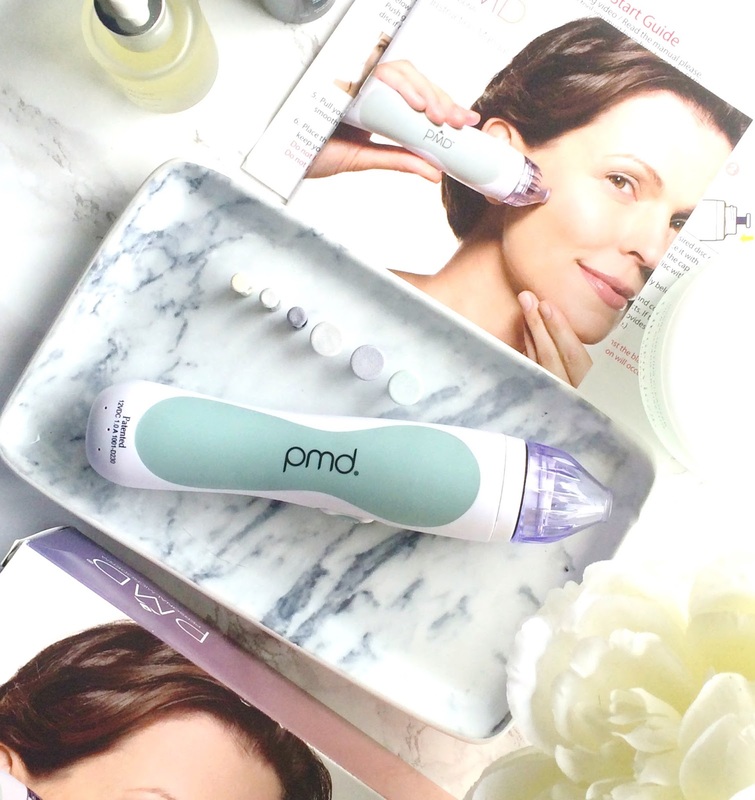 The PMD aims to buff away dead skin cells, reduce the formation of blackheads and reveal brighter and smoother skin. It is suitable for all skin types because we all benefit from exfoliation and all products that are applied afterwards can penetrate more deeply and give better results. It is very easy to use. 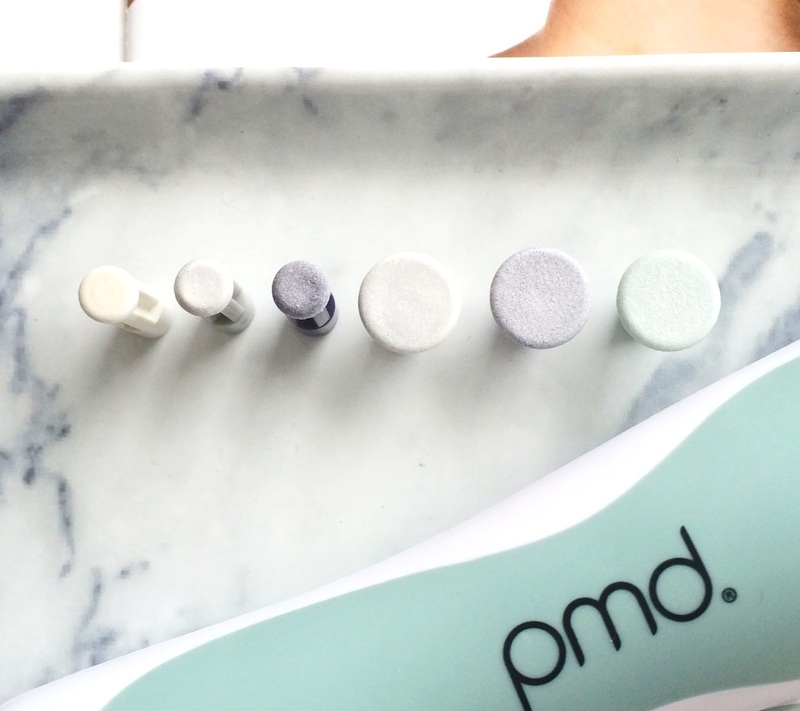 After cleansing and drying the skin (don't use any AHAs or retinols within 48 hours of using the PMD for obvious sensitivity reasons), start by attaching the white disc and cap to the device and then hold the skin taut and run the PMD over the area. It feels a little strange to begin with because it uses a vacuum suction motion as you move the device across the skin - don't drag or pull it, just literally run it over the skin. It isn't uncomfortable in any way but you must ensure that you don't go over the same area twice and hold the skin taut. It needs to be used upwards and outwards from the centre of the face, apart from on the nose where it is used up & inwards. When you are finished, you need to wash & dry the skin and then follow with some soothing skincare products (La Roche Posay Toleriane or any Omorovicza products are ideal as they are both very gentle). It is recommended that you test each disc on your arm initially so that you can test the level of exfoliaton before applying to your face. I started with the white disc and to be completely honest, I didn't see any difference in my skin however the next time I used it (I have been using it once weekly for the past 5 weeks), I used the grey disc and at this point I could begin to see a difference in my skin - my pores were less visible and the dry skin around my nose was a little smoother but it was when I moved on to the blue disc that I was really wowed. The little patches of dry skin around the bottom of my nose and the congestion on my chin has been banished. Also, you know those really annoying little under skin bumps that appear on the jawline? They're gone too! My skin is overall so much smoother, which is probably due to both the exfolation but also the fact that my products can penetrate deeper now. I will continue to use this on a weekly basis because I am super impressed with the results. I have yet to try it on my body but when I do, I will let you know my thoughts. Each disc can used 3/4 times before it needs replacing. The replacement discs are priced at £19/€23.45 for a set of six and the PMD itself is priced at £150/€164.95. I understand that some people might wince at the price but it is less than the price of 3 in-salon treatments and the results are excellent. I would highly recommend it to anybody who is concerned with ageing skin or who is suffering from congestion or even just dry skin because the results are amazing and it can all be done in the comfort of your own home! Have you tried microdermabrasion before? I would love to hear your thoughts on this product - please tell me in the comments below! The PMD Personal Micrdermabrasion was sent to me. Opinion and review is, as always, entirely my own and very honest!